Woman set alight following row. 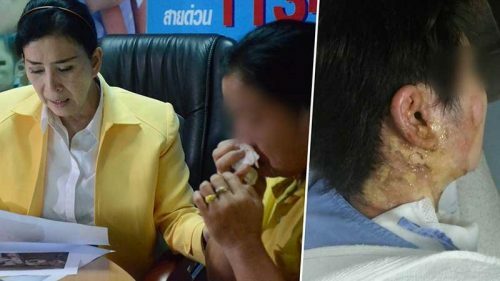 A Bangkok man who doused a 22 year old Thai woman from Ubon in gasoline while she was eating with friends at a Som Tam stall and then set her alight , has been arrested. Incredibly the 23 year old Thai man was given bail by the court in Bangkok. He then told a friend of the victim that she was next. The 22 year old woman, a clothes designer living in the Charoen Krung area of Bangkok, is still in hospital following the horrific attack and has not been named. The mother of the victim went to Paveena Hongsakul of the foundation for children and women that bears her name for help yesterday. “Mon”, 44,, an Ubon teacher, said her daughter was eating with friends at a Som Tam stall on July 8th. A man called “Geng” arrived who was the ex boyfriend of a friend. An argument broke out in which Geng threatened to “burn her” before he disappeared. No one knew what he meant but they were soon to find out. Thirty minutes later he came back and to the horror of friends and other diners produced a whisky bottle containing gasoline. He got the 22 year old in a headlock and covered her in the fuel before setting light to her. She was rushed to Charoen Krung Pracharak Hospital where she was treated for second degree burns to her neck, torso, legs and arms. Doctors said she would need to stay in hospital for at least a month. The assailant was apprehended in a citizens’ arrest and Wat Phraya Krai police took him into custody. But subsequently he was bailed by the court. Mon told Paveena that he then went to see a friend of her daughter to say that he had not finished with her daughter yet and that she was next. Paveena is now in contact with Wat Phraya Krai police chief Pol Col Kosit Bunthawee and has called for the man at the center of the case to be rearrested. A press conference is planned for today.